Download "Research Report. 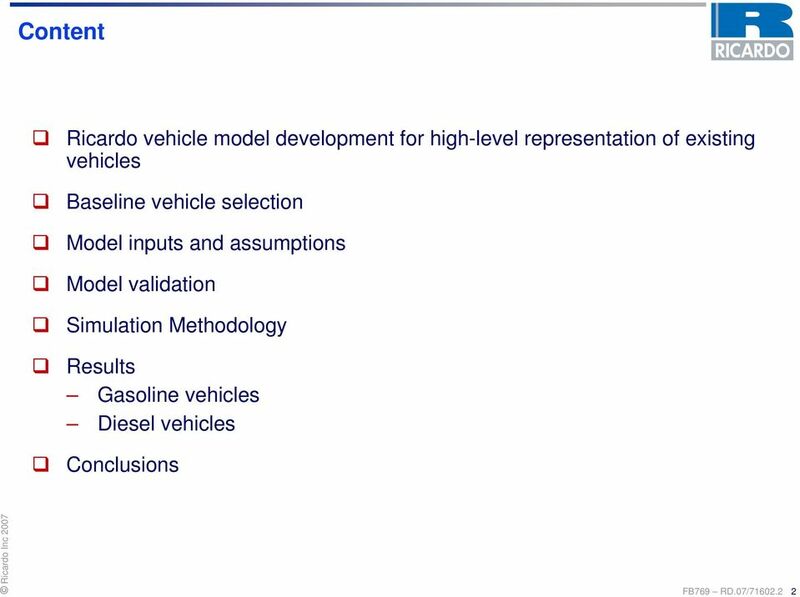 Impact of Vehicle Weight Reduction on Fuel Economy for Various Vehicle Architectures"
4 FB769 RD.07/ Vehicle Modeling Using MSC.EASY5 TM A full forward-looking, physics-based model was developed for each baseline vehicle using commercially available MSC.EASY5 TM simulation software with Ricardo proprietary data as well as published information. 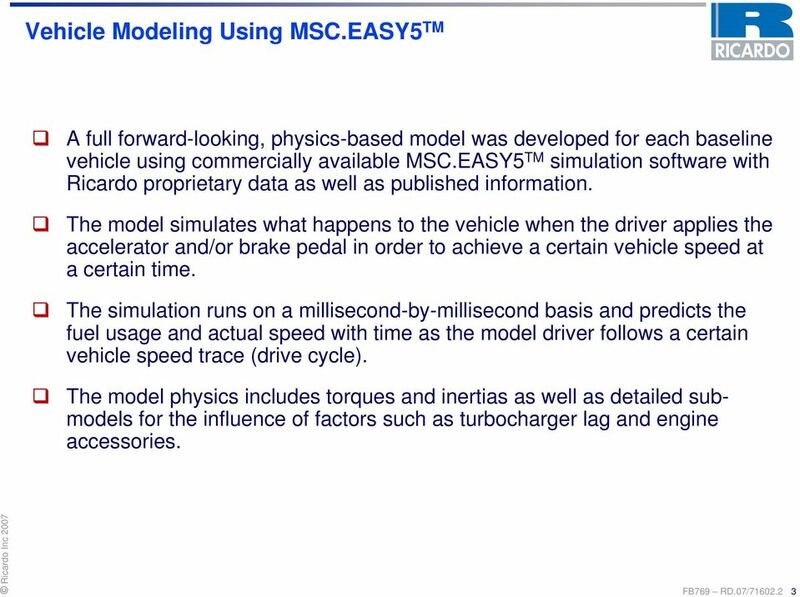 The model simulates what happens to the vehicle when the driver applies the accelerator and/or brake pedal in order to achieve a certain vehicle speed at a certain time. 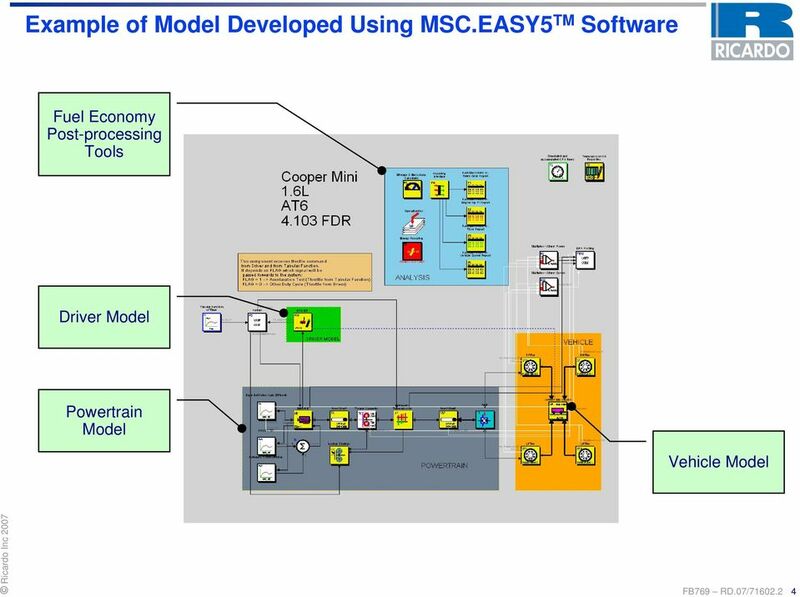 The simulation runs on a millisecond-by-millisecond basis and predicts the fuel usage and actual speed with time as the model driver follows a certain vehicle speed trace (drive cycle). 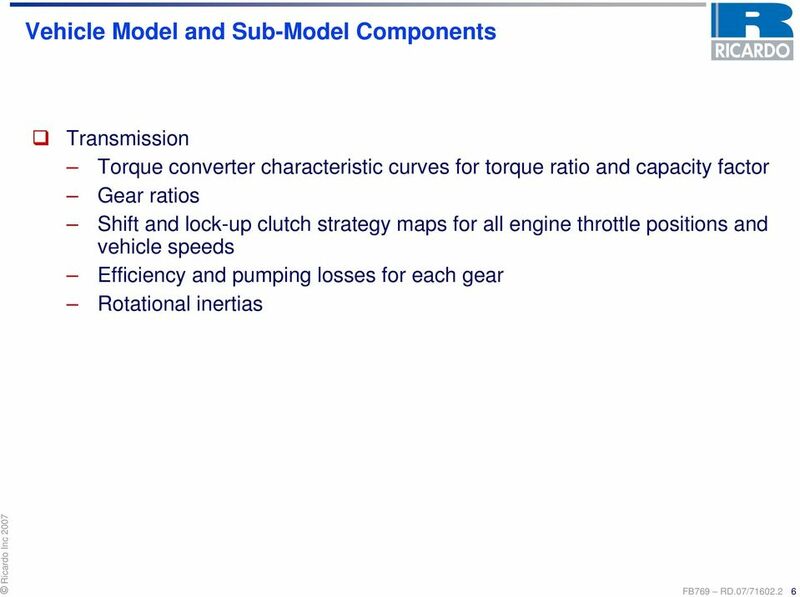 The model physics includes torques and inertias as well as detailed submodels for the influence of factors such as turbocharger lag and engine accessories. 8 FB769 RD.07/ Vehicle Model and Sub-Model Components Final drive differential Gear ratio Efficiency Rotational inertia The spin losses of the 4-wheel drive vehicle s front axle were also included in the model to simulate the fuel economy and performance of the 4-wheel drive powertrain operating in 2-wheel drive mode (similar to EPA procedure for emissions and fuel economy certification testing). 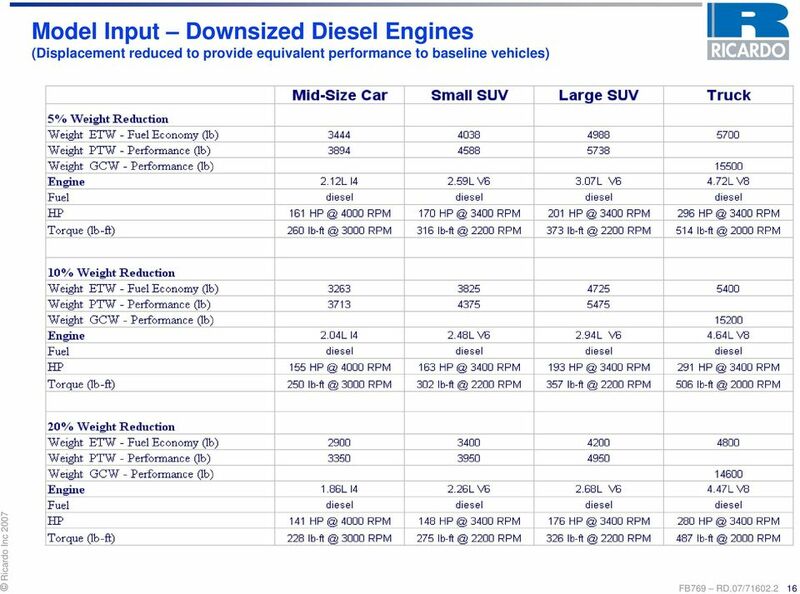 13 FB769 RD.07/ Diesel Engine Selection Diesel engines were selected to provide improved fuel economy and acceptable (not equivalent) vehicle performance. 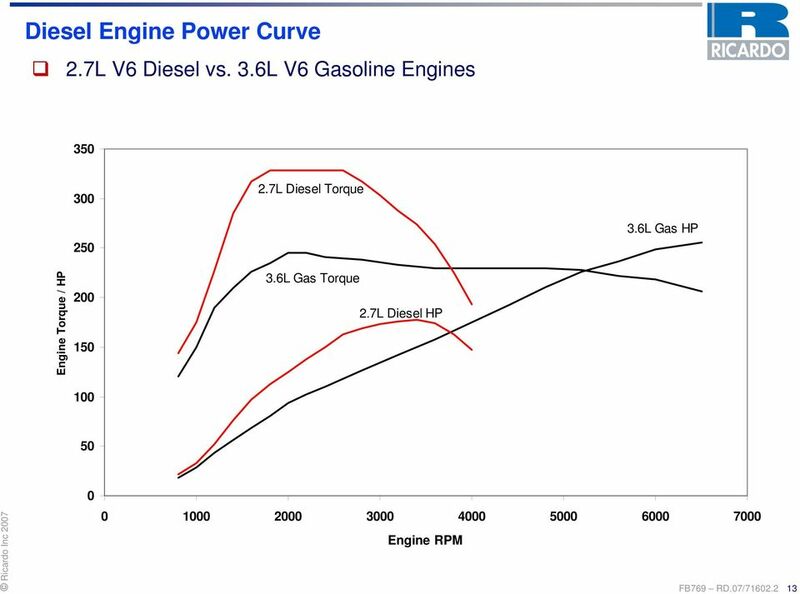 The characteristic turbocharged diesel power curve (high torque at low speed) has more torque in the typical cruising and light acceleration engine operating range ( RPM). At 50 to 70 MPH in 6 th gear the diesel provides more reserve torque so that light pedal tip-in acceleration demands are superior to the gasoline engine. 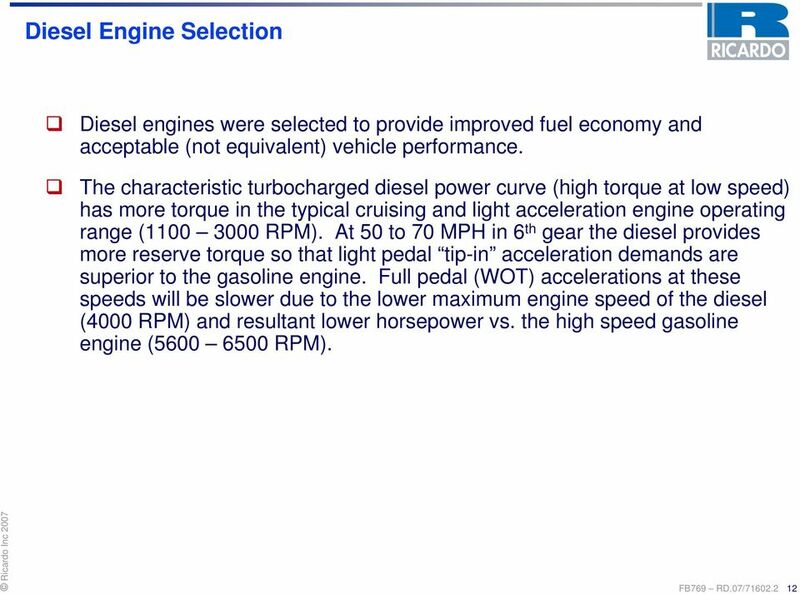 Full pedal (WOT) accelerations at these speeds will be slower due to the lower maximum engine speed of the diesel (4000 RPM) and resultant lower horsepower vs. the high speed gasoline engine ( RPM). 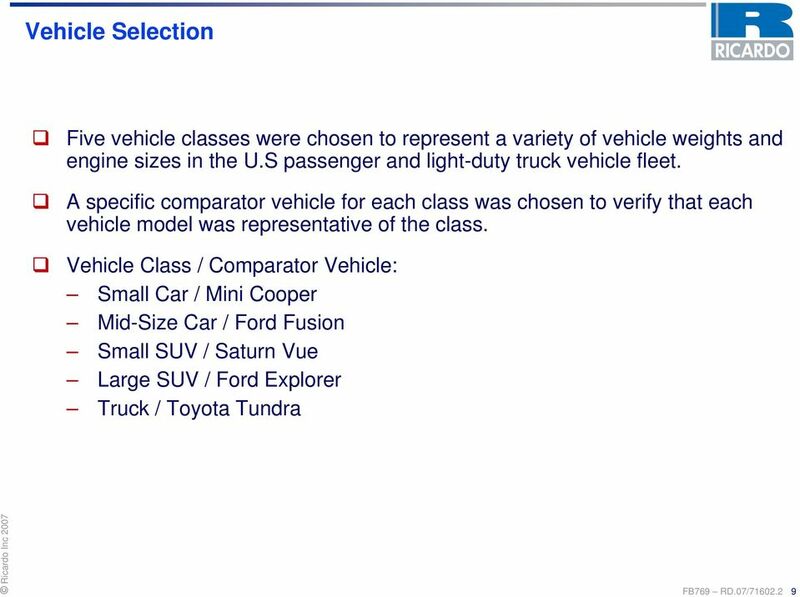 21 FB769 RD.07/ Vehicle Performance Matching The Wide Open Throttle (WOT) performance of each vehicle is simulated at a loaded weight condition to approximate what a customer would expect from a given class of vehicle (number of passengers, luggage or trailer towing). 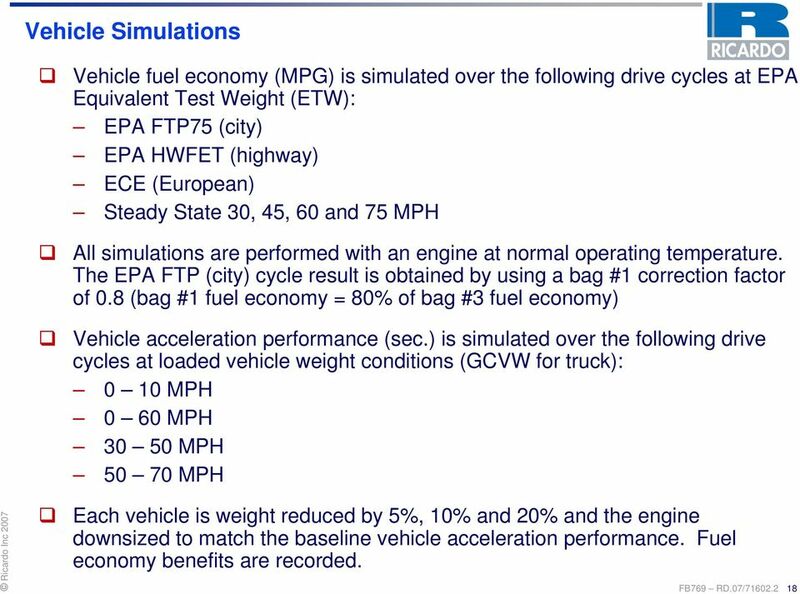 All fuel economy simulations are performed at ETW. Additional Performance Weight: Small Car 300 lb. (2 passengers) Mid-Size Car 450 lb. (3 passengers) Small SUV 550 lb. (3 passengers lb. Luggage) Large SUV 750 lb. (5 passengers) Truck 9800 lb. (Trailer + load to rated combined weight of 15,800 lb.) 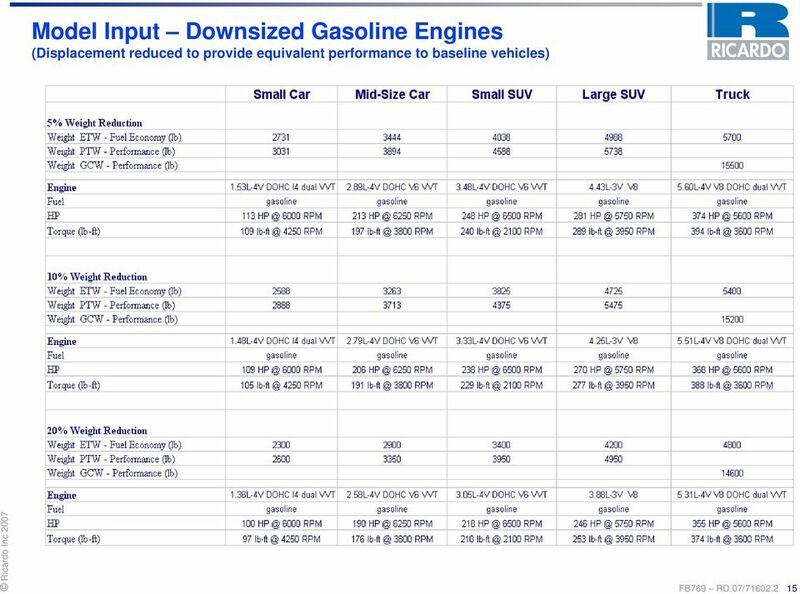 Engines were downsized in displacement to give the weight reduced vehicles equivalent performance to the baseline vehicle with a priority given to passing maneuvers (30-50 and MPH). 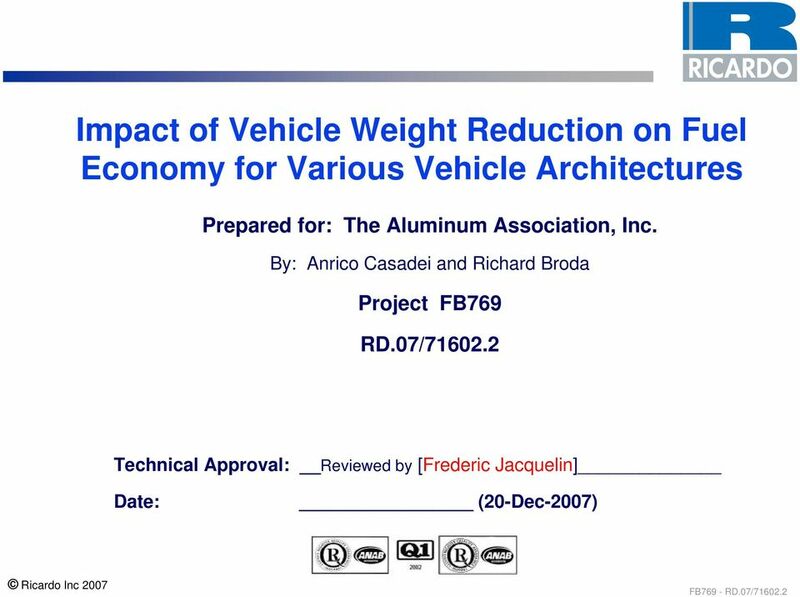 60 FB769 RD.07/ Conclusions / Observations Reducing vehicle weight (mass) results in less tractive effort required to accelerate the vehicle and less rolling resistance from the tires. 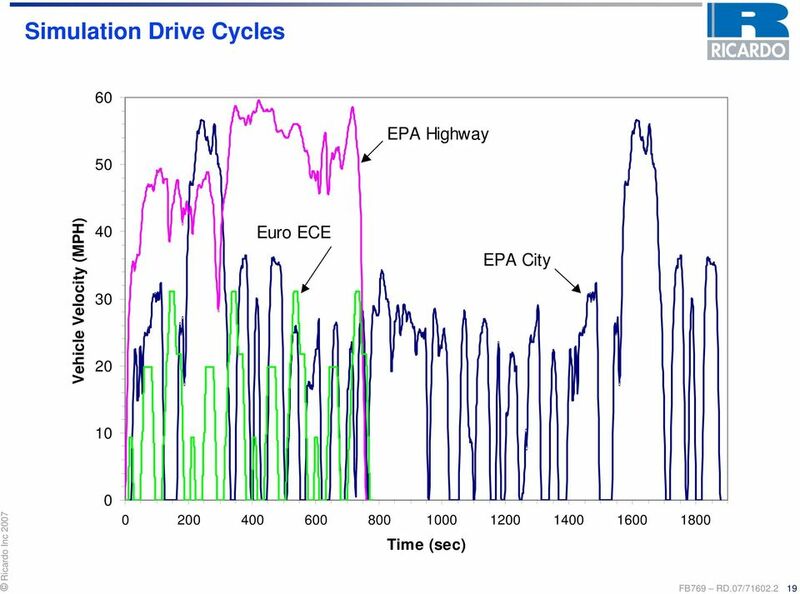 Drive cycles with more acceleration events (EPA city and European) show greater fuel economy benefits from weight reduction than highway or steady state conditions. 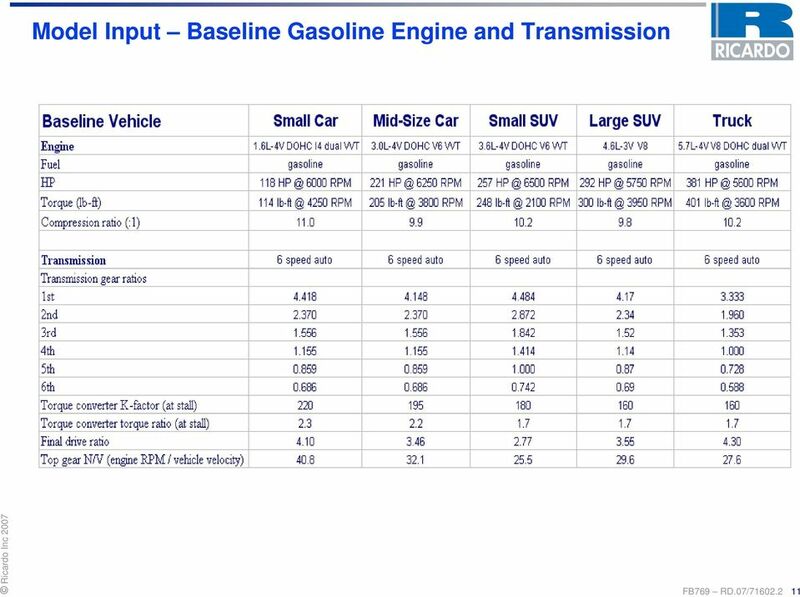 Also, at higher vehicle speeds the engine is typically at higher throttle (better BSFC) operating points and provides less opportunity for improvement. 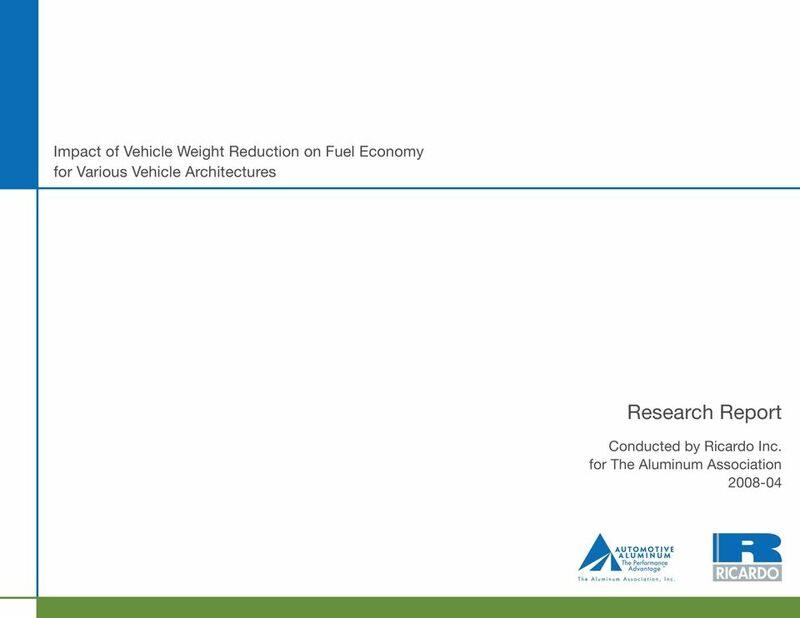 Since the tire losses are a greater percentage of total tractive effort at lower speeds (aerodynamic losses increase by velocity squared) the potential for fuel economy gain from weight reduction is greater at lower vehicle speeds. 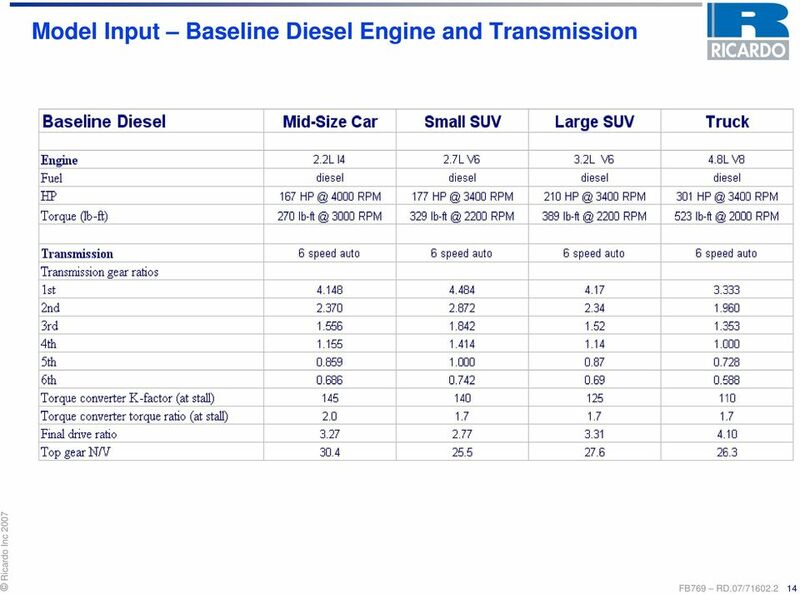 Fuel economy results (and improvements) at the steady 30 MPH drive condition vary because most vehicles are not in top gear yet and are operating the engine at a higher speed / lower load point that is less efficient. 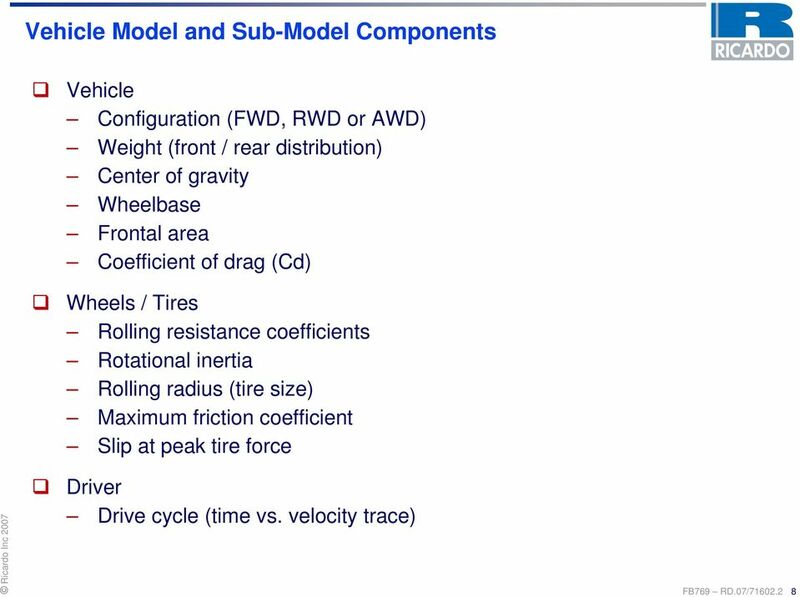 Less tractive effort results in less engine torque demand at a given point in the drive cycle. 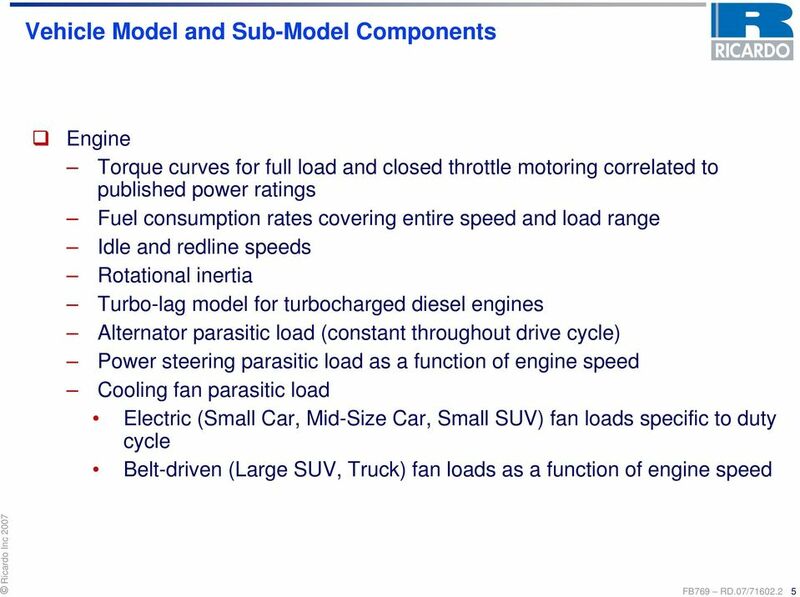 The lower load (throttle) demand puts the engine at a less efficient point with more pumping loss and lower brake specific fuel consumption (grams fuel / power produced). 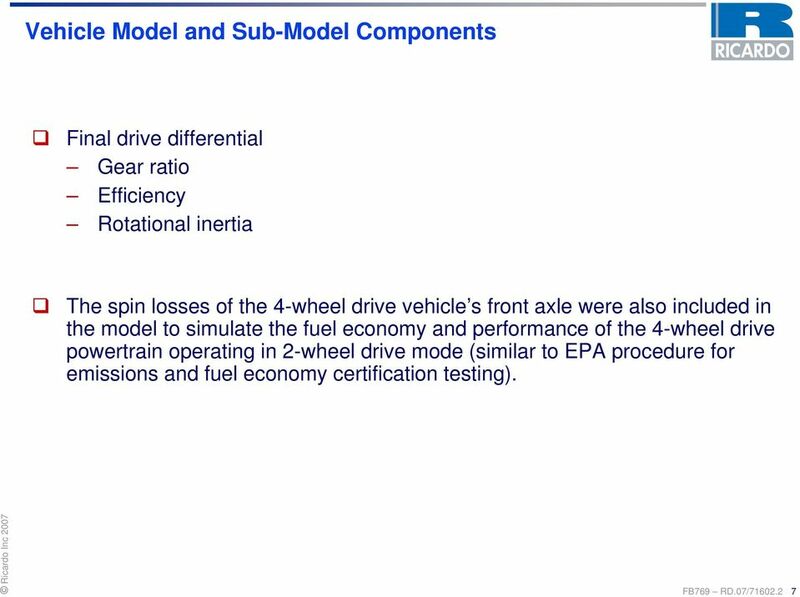 Reducing the engine displacement of the weight-reduced vehicle to equal baseline vehicle performance increases the brake mean effective pressure (BMEP) of the engine operating points and improves efficiency. A final drive ratio change could also partially offset the pumping loss increase but was not investigated. 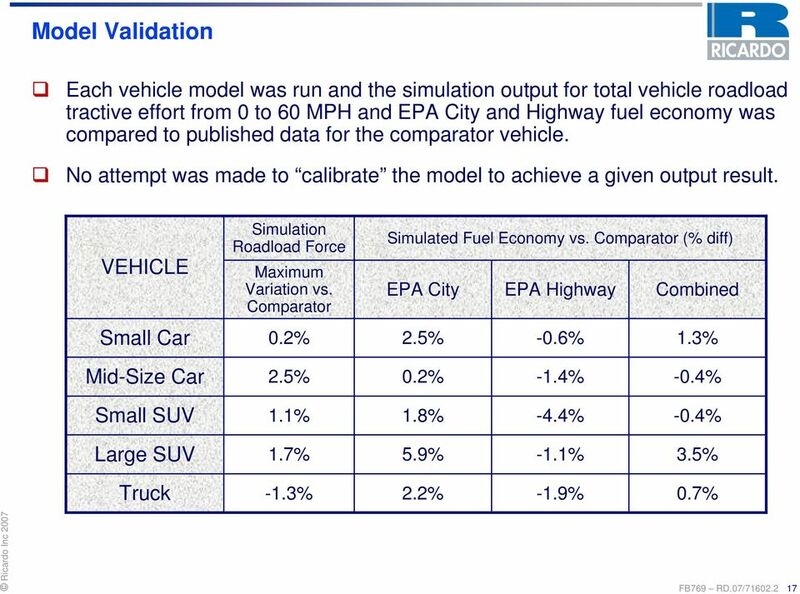 The Small Car with a 1.6L engine with variable valve timing and variable lift technologies that reduce pumping losses shows the largest % fuel economy benefit with the baseline engine since it can operate at the reduced engine load points more effectively (0.42% fuel economy benefit / % weight reduction vs. other gas engine vehicles at % FE benefit). 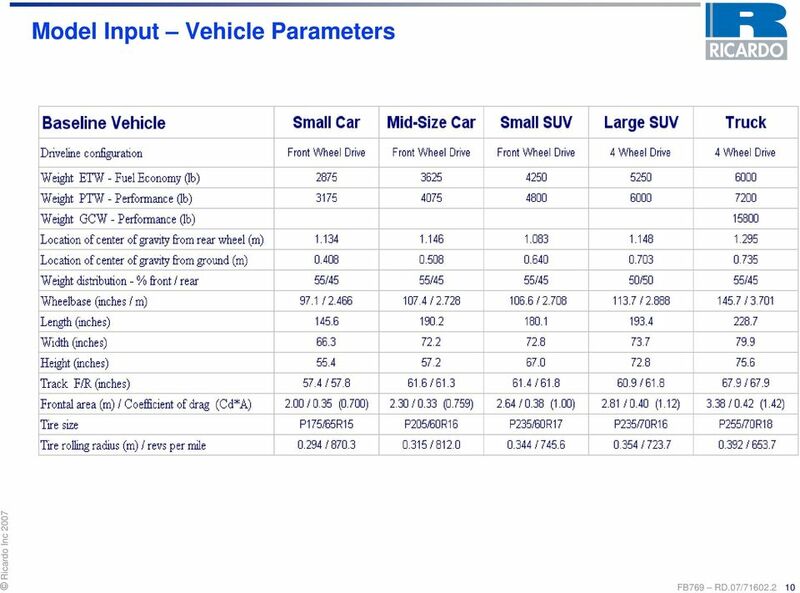 When the engine is downsized it produces fuel economy gains similar to the other passenger vehicles (0.66 vs % FE / % weight reduction).